Comfy, pull-out sleep/sofa featuring a mixed hardwood frame with polyurethane foam padding for comfort and to avoid any sharp edges. Gently curved backrest when in the upright sofa position that may be pulled out to form a 48" deep sleep surface. Features gently curved armrests for added appeal and comfort. 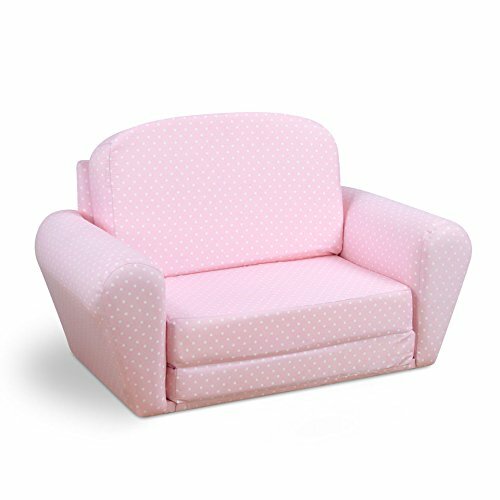 This sweet dreamer is Upholstered in 100% cotton with a pink background and an all-over white polka-dot pattern. When pulled out in the sleeper position, the top surface is covered with a coordinating solid bubblegum pink polyester microfiber. This offers a nice, soft place to lie on, and it may easily be cleaned by gently rubbing with a damp cloth and mild soap. The bottom is covered with black upholstery fabric and there are round plastic knobs on the bottom corners to avoid wear and tear of the fabric. Ships fully assembled!.